Decorating your bathroom is one of the most important design jobs you'll ever have in your home. It may not seem that way at first, but it's so much more enjoyable to spend time in a well-decorated bathroom than in a bathroom that's completely sterile and functional. Clean and functional are good things for a bathroom to be, but if that's all they are, then they miss out on a lot of potential design impact. Decorating a bathroom has endless possibilities, ranging from a rustic escape from your modern decor to own personal spa retreat. A bathroom is a high-use room. It is used by all family members, multiple times a day, so plan ahead for a vision that works for you and your lifestyle. Whatever the vision for your ideal bathroom may be, there's any number of beautiful upgrades that you can use to create the look that you're craving. Without a doubt, one of the best tools at your decorating disposal is wallpaper. It provides a wide variety of uses at a wide range of costs. Wallpaper has begun enjoying a comeback on the interior design stage and for good reason. While we may be more used to thinking about it as a design element in our bedrooms and living rooms, there's plenty of great ways to use wallpaper in a bathroom as well. The same rules apply in wallpapering a bathroom as in any other room. You can cover the whole room or just one wall (an accent wall) that will be the focal point of the whole space. Either option works, but in a bathroom, there are a few reasons why you might want to go smaller with wallpaper than in other spaces. Bathroom wallpaper can cause problems since the moisture and humidity might cause it to peel off. Even with the greatly improved wallpaper adhesives available on wall coverings today, the conditions that exist in every bathroom can have an effect on the adhesive over time. If you do choose to wallpaper your whole bathroom, or especially the area by the sink and tub, opt for "splashproof" wallpaper. This type of wallpaper is specifically designed for high humidity areas and is even wipeable, should anything get on it. If your bathroom is well-ventilated and doesn't get very humid, standard wallpaper should work fine in your space. If you have your heart set on wallpaper, there are five ways to start to experiment with bold color, splashy finishes, and large prints in your commode. If you have a separate toilet room or stall out of the main area of the bathroom, use wallpaper in just this small area. The wallpaper will highlight the two rooms (or areas) and place the wallpaper away from the humid shower to protect it. If your home has a jack-and-jill bathroom, install wallpaper in the areas that are outside of the shower and bath space, like just the sink area in between the stalls. Use complementary paint colors for the two bathroom stalls to tie the whole room together. 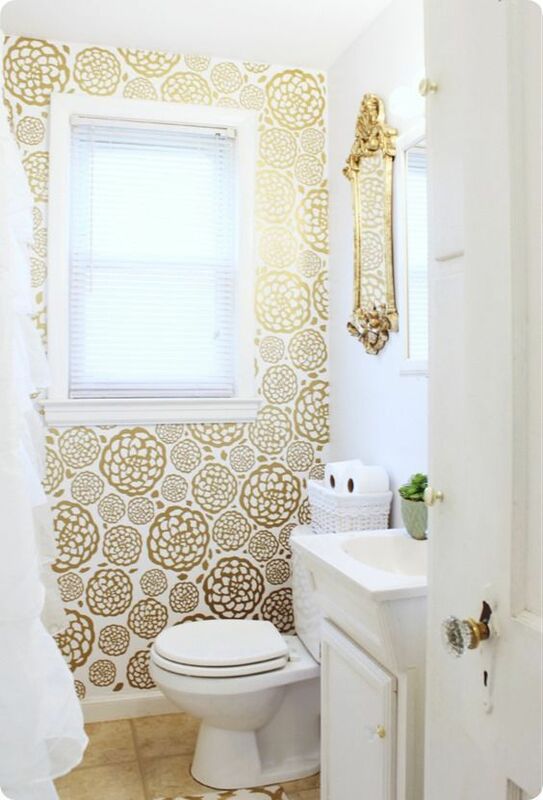 Use beautiful bathroom wallpaper for extra punch in a small powder room or half-bath. These small areas won't have a shower or bathtub that will steam up the room and negatively impact the wallpaper. Don't shy away from a big, bold pattern in a small room. For a special custom touch in any bathroom, consider a wallpaper border below the ceiling or around a mirror, window, or door. Another option is to wallpaper only one wall, creating a standout accent wall. If you have a wallpaper you truly love but can't manage to wallpaper the walls of the bathroom, simply buy one sheet, frame it, and hang the frame in the bathroom. You'll turn the wallpaper you love into a standout piece of artwork. If you're thinking of putting wallpaper in your bathroom, check with the guidelines of the paper and adhesive you're considering. Read the installation instructions, prepare the walls carefully, and go for it. Wallpaper in a bathroom makes a very special little room.